Hi everyone! I’m Rita and I blog at TOMORROWtoday. I'm so excited to be guest posting for Heidi while she is enjoying herself on vacation! One of my favorite recent posts of Heidi’s was partyto outfit, so for today’s post, I thought I'd recreate it with one of my favorite blog-world parties. One caveat? The outfit needs to work for all of the upcoming holiday parties I'm already starting to get invited to! 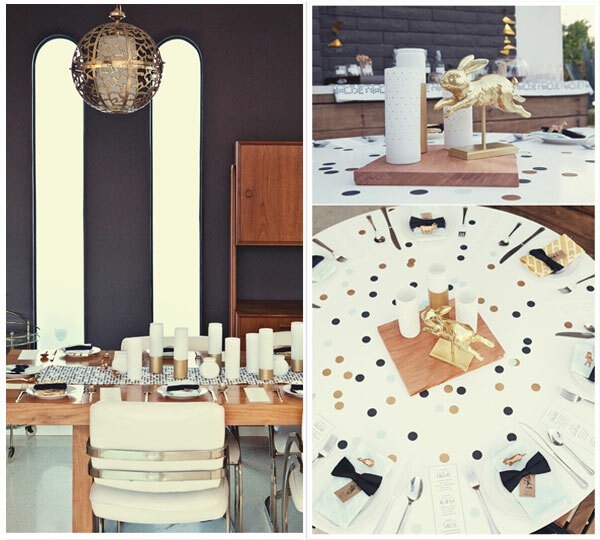 I loved this 30th birthday party when it was posted on 100layer cake - it's the perfect mix of neutrals, mixed metals, simple modern and a little bit of whimsy. I got really stuck on this Milly petal skirt -- it's basically just perfect! But I couldn't decide if I wanted to go for a sweet and girly look or a little more casual and tough (I'd totally feel like a badass in this outfit!)... which do you like better?!? These outfits are definitely a dream... but I really do think this skirt could be a versatile party piece all season long! made more casual with a comfy tee and metallic cap toe flats, dressed up even more with a fitted black tank.... the options are endless! Adoring that petal skirt!! I really like both looks...such a great versatile piece. Thanks for having me today,Heidi! Loved this post idea!